mango | This Girl’s Gotta Eat! Thanks to our CSA share from Fresh Fork Market, this was my first time using kohlrabi. After doing a little research on how to prep it, I knew I wanted to make a salad or slaw with it. This salad is easy, so tasty and crunchy, not to mention pretty! After all, we do eat with our eyes first and I couldn’t wait to dig in! Remove the branches and cut the kohlrabi bulb in half. Carefully using a large, sharp knife cut the outer layer away. Slice into matchstick size pieces. 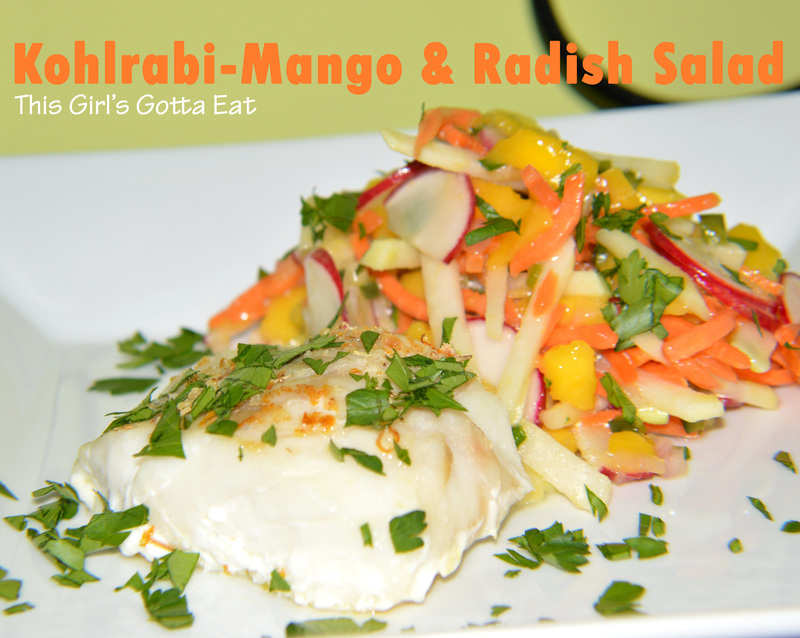 Add to a medium bowl with mango, radishes, carrots, red onion, peppers and green onions. Toss with rice vinegar, olive oil and salt to taste. Garnish with parsley and serve with a protein of your choice. Pictured above is baked cod. 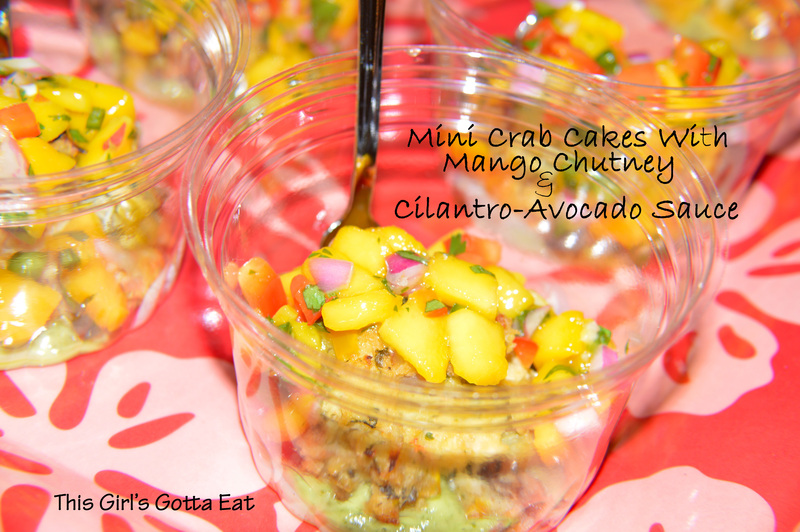 Categories : Entice, Fish, Meatless, Satisfy, This girl has recipes! 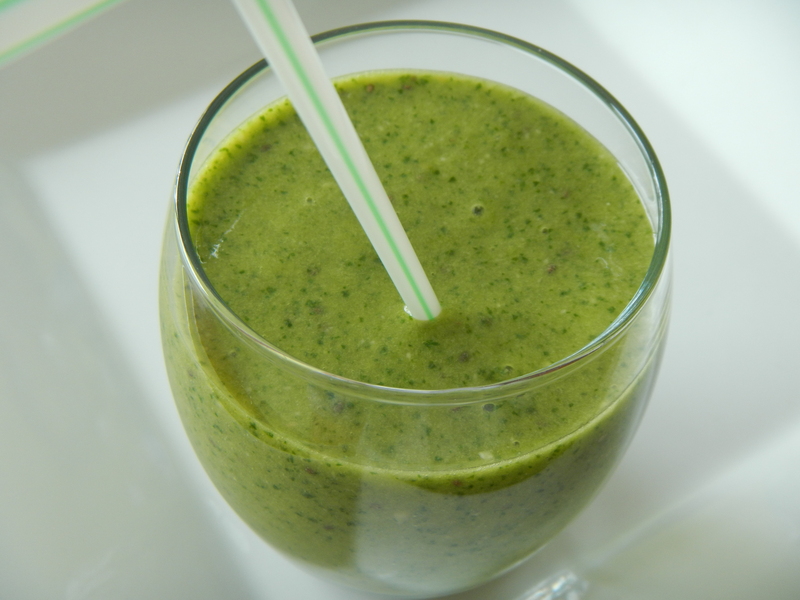 The inspiration for this smoothie came from several places, one being from family and friends in my life that can’t have dairy. Mango and kale are delicious smoothie ingredients. And used in this herbals-based version, you’ll get tons of nutrients and antioxidants, while remaining dairy-free. And better yet, thanks to the naturally sweet herbals and fruit, you won’t need any extra sweeteners either! A fun fact about herbal “tea”…it isn’t actually tea at all, as it doesn’t contain tea plant leaves. Rather, herbals are typically infused with herbs, spices, fruits and flowers. They’re naturally caffeine-free and low in calories, making a perfect base for a healthy smoothie. Steep tea in hot water 3-5 minutes, and cool. Add the kale and the tea to a blender and pulse a few times to chop the kale. Add the remaining ingredients and process until smooth. In a food processor puree (until smooth) the chipotle, mango, cilantro, lemon juice, vinegar, 1/2 Tbsp oil, garlic and salt and pepper to taste. Whisk about 2 Tbsp of the chipotle-mango sauce with the broth. Add the broth mixture to a medium oven-proof skillet and bring to a boil over medium-high heat. Add cod filets and transfer skillet to the oven. Poach until fish flakes with a fork, about 20-25 minutes. Transfer the rest of the chipotle-mango sauce to a small saucepan and simmer over low heat until thick, stirring often, about 15 minutes. Meanwhile, heat some olive oil in a large saute pan (couple turns of the pan) over medium heat. Add asparagus, season with salt and pepper to taste and saute, stirring occasionally until tender-crisp, 5-7 minutes. 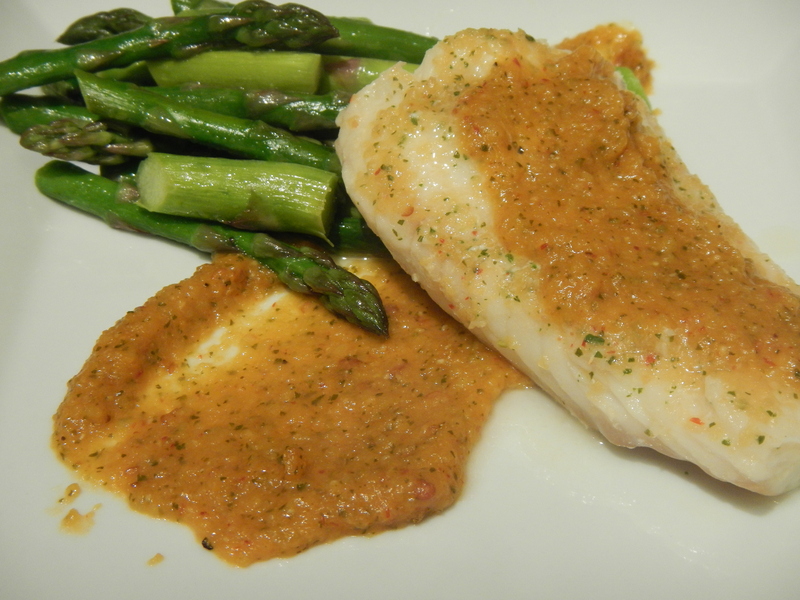 To serve, dish some of the warmed chipotle-mango sauce on plates and top with cod and asparagus. Serve more sauce on top if desired, and a side salad.